I have been writing for a long time. Heck, I’ve wanted to be a writer since middle school. I’ve been writing ever since. The very first book I wrote took ten years. It’s a mess. You’ve never heard of it. It’s shelved on a floppy disk (remember those?) among other places but was never revisited. Then, during my time in Oxford, I was inspired to write School of Deaths. It took me a year to write, and then I began trying for agents. In publishing, if you want your book published with the big publishers, distributed widely, and making money, you need an agent. The “Big Five” publishers (all subdivisions of just five companies) only take manuscripts from agents, and even then it’s not always a guarantee of publication, much less success. Yet agents are the first gatekeepers in the business. Getting an agent involves writing a query letter. This is a single page long- a blurb about your book, a paragraph about similar books in the marketplace, and a paragraph about you. It’s an email you send out and know you’ll probably never hear back from. Some agents ask for just this, some for your first five pages. Most agents receive hundreds of email queries a DAY. Of those they receive, they might request pages from 5%, and of those pages, maybe request a full manuscript from an even smaller number. And it’s not just based on the quality of your writing. It’s based on a lot of subjective factors, like the agent’s preferences, if they think they can sell it, does it conflict with other clients they have, and so on. In short, getting an agent is very, very difficult. It feels a bit like falling through mid-air and trying to catch (and hold onto) a single raindrop. Small press is a form of traditional publishing in between the big guys and self publishing. In a way, it’s sort of like the minor league baseball league. Minor leaguers are pros, and paid to play ball, and some are amazing, but you’ve never heard of them. They’re all hoping to make it into the majors, but to do so they need that scout. With writing, you need an agent. After Scythe Wielder’s Secret I wrote a sci fi thriller and re-entered the querying phase. Months passed. Nada. I’ve since decided to rework the project. Then, I had an idea for a book. A series. The ideas kept coming and coming. A world that’d been in night for a thousand years, and now faced a sunrise. A man with a powerful form of magic, and a terrible price. An exciting new fantasy series called Everdawn Rising. I wrote the book, and right away knew something was different. It was without a doubt the best thing I’d written. I decided, yet again, to plunge back into querying. Querying is a SLOW process, I’ll add. Some agents have an AVERAGE response time of 115 days. That’s just to hear back, even if it’s a no. And if they request pages or your full manuscript, you have to wait months upon months. I began querying Everdawn in January. I queried and queried. I became active in the Manuscript Academy, which gave me a lot of opportunities to work with pros. I had skype sessions with agents and not only pitched my book, but got help rewriting my query. I was in a workshop to help revamp my first page and ended up a part of a writing community that’s still wonderfully supportive today. And I worked with editors from St Martins and Tor (two imprints of the “Big 5” publishers) to rewrite the beginning completely. On the advice of an agent, I began “re-querying” – contacting agents who said no months ago or who never responded. I was hopeful, but still not sure. I was ready to enter PitchWars when everything took off. First I got an offer from an agent. I then had to let my outstanding (hadn’t heard from them yet) requeries know. Within hours, I had six more full requests. I eventually got a second offer and it came down to an insane day of phone conversations, nerves, and difficult decisions. After talking to the two agents, however, I knew the original offer was the agent I wanted to stick with. I am elated to announce that I am now represented by Will Reeve at the Virginia Kidd Literary Agency. Kidd is a smaller agency, but one with an impressive track record in SFF, launching the careers of greats like Isaac Asimov and Ursula LeGuin. This is only one stage in a longer journey. The next step is for Will to work with me editing the book, then he’ll take the manuscript to the publishers and try to sell it to them. Even then, it’s a while before it releases. However, this is a huge step for me and my career as an author. Don’t forget to check out our other posts HERE. Find Christopher Mannino at the Young Adult Author Rendezvous HERE. Outlining—you either love it or hate it. I happen to love it, and I’m going to share my approach with you today. When I was in school, outlining felt suffocating. It was like death to creativity. Nothing irked me more than a free writing assignment that required an outline—and I usually wrote one after the fact (not exactly what my teachers had in mind, I’m sure). Years later, when I was attempting my first NaNoWriMo, I decided I needed some sort of strategy to get my word count in. I wrote the major points of my book in three paragraphs and called it good. And it was pretty good. I knew the main events and the ending, and it helped a bunch. But at the end of November, my manuscript was still a mess. I knew I could do better. Fast-forward a couple more years, and now I proudly call myself an obsessive outliner. I use a mishmash of techniques that I’ve tweaked to fit my style. Before I begin to explain how I do it, I want to say that I don’t think there’s a right or wrong way to outline—you need to do whatever feels good to you. And if that means pantsing it (writing by the seat of your pants), then do it! This is just what works for me. I hope it’ll help you as well. First, I start by summing up my story into one paragraph. What’s it about? Who are the characters? How does it end? After that, I divide my idea into four parts and write a summary paragraph for each section, making sure to end the first three sections in conflict. I like to have something inconvenient happen to my character at the quarter mark and halfway through the book. The climax hits about three-quarters of the way through, and then the last quarter is for overcoming the problem and wrapping up the story. There are several ways you can go from this point. You have your story’s skeleton—you can start writing, if you want. Some writers will go on to expand these paragraphs into a page or two. Others may take it a step further and begin chapter outlines. That’s what I like to do. I decide how many words is ideal for my novel. Then I decide how many chapters I want. For an 80,000 word novel, I’ll usually shoot for thirty. I like to write in short chapters, and that puts me at just under 2,700 words in each. You can have shorter chapters; you can longer ones. It’s completely up to you, and they’re bound to change as you’re writing. Since I know I need my conflict at 1/4, 1/2, and 3/4 of the way through the story, those are the first chapters I fill in. For example, for my 80,000 word novel, I will have the 1/4 conflict at 20,000 words, which will fall in Chapter 7. After I have my conflict in place, I begin to fill in each chapter. These little summaries don’t have to be long. I write a paragraph for each. Often, I will find I don’t have quite enough story points to fill them all in, and I brainstorm for ideas until I have a story that flows from beginning to end. Now, as I’m writing my book, things often change. I’ll just go back and tweak my outline as needed. Sometimes one of my chapters will end up as two chapters. Other times two chapters may merge into one. Nothing is set in stone. The outline just keeps me moving toward the conflict. After that, I begin to write! That’s really all there is to it. During my planning stages, I also like to fill out character and setting questionnaires. They really help if you’re stuck in the development stage; you’re bound to get new ideas when you’re working on them. Whether you choose to outline or not, I hope this was useful for you! Also, if you have your own technique, be sure to add it in the comments. I love to hear how other people tackle the pre-writing stage. Want more from Shari? You can check out her books on Goodreads HERE. Find Shari on the YA Author Rendezvous site HERE. This was posted by Lauren Mayhew with the express permission of Shari L. Tapscott. First posted at Young Adult Books Central. A painter has their paint brush. A sculptor has their clay. What does this have to do with indie publishing? Just like that painter and that sculptor, a writer is an artist. Artists create. They create beauty, tragedy, the illusion of reality. They show us how things are and how things should be. As creators, we must use what is available to us – tools of the trade. A lot of this can be said for both indie published authors and traditionally published ones. No matter the size of the publishing house you have behind you, there are certain things you must do for yourself. Writing, for example. Still, there are some tools that will be used more by indies who must make their own advertising graphics, choose their own Amazon key words, and handle their own marketing. I’ve listed seven of my favorite “brushes” for our form of artistry. Scrivener – Every author no matter their publishing path can benefit from this tool and that’s why it’s at the top of my list. It isn’t free, but it is very affordable. Scrivener is a writing program. It’s used in the same way many people use Word, but there are benefits. It’s a bit more stripped down than Word, simple and easy to use. The best part about it is the way it organizes your book. These novels we write can reach into the hundreds of word pages. Have you ever forgotten something you wrote and had to scroll through the entire document to find it? In Scrivener, documents are divided into chapters that you can name and move around at will. They also provide character building templates so you never again have to wonder what color eyes you gave a character in some previous chapter. Canva – Photoshop is expensive and kind of confusing if you ask me. Canva is an online tool that allows you to import images (or buy stock photos from them) and manipulate them, changing colors and adding text, to create ads or promotional images. It’s easy to use even for an image illiterate like myself. I’d be lost without canva. KDP Rocket – Are you wanting to write a book that has a jump start in popularity? This is called writing to market and many indie authors are doing it. KDP Rocket is a program that helps identify trends and fads in the marketplace to allow you to jump on board. That’s only one of its many features. It can also help determine which keywords would give your book the largest boost. And have you ever wondered about the kind of money certain books are bringing in? Now you can see exactly how each book in the Amazon marketplace is doing to help you decide which genre you’d like to jump into. It can be fun. The program isn’t free, but it can be worth it for indie published/ self-published authors. Social media management programs – there are many of these including Buffer andHootsuite. As authors, we’re expected to maintain a presence on so many different platforms that if we aren’t careful, all of our valuable writing time will be sucked away. These programs streamline social media. They allow you to post the same thing across different platforms with a few clicks. You can plan ahead, down to the minute, your posts to Facebook and Twitter. I can schedule an entire month’s worth of posts in about an hour. The small fee is incredibly worth it. The Emotion Thesaurus – Really, I could put the entire series and the connected website here. The Emotion Thesaurus is a book that has a page dedicated to any emotion you can imagine and describes things like body language of feelings associated with it. The series also contains books for character traits and settings. The website connected to the books is called Writers Helping Writers and has more resources in one place than you can even imagine. Calibre – A completely free ebook management program that I always find some use for. As an indie, you will most likely be sending out your own review copies. Calibre allows you to convert them to any format that is requested from you so they can be read on any device. This has been helpful to me because I also help other authors by reading their work. Many of them send it in Doc format which doesn’t read so well on my Kindle. Instead of having to read on my computer, I can easily convert it to the format I need. Bookfunnel (or Instafreebie) – Do you send out review copies to your advance team? Do you give away ebooks in large giveaways? Whenever you need to send a book, wouldn’t it be easier to just send a link and then have the reader download the book on any device they prefer? That’s what these sites allow. They also let you collect emails of the people who download your book which is invaluable if you’re focused on building a large Newsletter (which you should be). There are so many great resources for writers out there and with the rapidly growing indie publishing industry, more are popping up all the time. None of these replace the best resource available, though. Other authors will forever be the best source of marketing advice and support as well as critiques and cross-author promotions. The tools are out there to make a go of it in this industry. The biggest thing I’ve learned is to never be afraid to try the new ones that come along. Experiment, see what works for you. Don’t be afraid of technology and never ever think social media is a waste of time. In the crowded market, we need to be everywhere. We must make it as easy as possible for readers to see us and get ahold of our books. As indies, we don’t have the huge teams behind us, but in today’s world, some successful authors are finding they don’t need them. See Michelle at the Young Adult Author Rendezvous HERE. Conflict sells. Whether you are reading a book, watching TV, or viewing a movie, if everything is happy-go-lucky all the time, there isn’t much reason to keep reading or watching as you probably aren’t wondering what will happen next. People thrive off of twists and turns. They want mystery, suspense, and indecision. They desire friction, as it escalates plotlines, enhances character development, and reinforces the age-old quest for sheer entertainment. We live in an “entertainment culture,” if I do say so myself. People seek entertainment because it stimulates their senses. It excites their emotions, and it offers something in place of predictability. Despite the wish for a happy ending – and believe me, I ooh and aah with the best of them for one of those – trials, tribulations, and all those annoying adversaries must come out of the woodwork to make that happy ending all the more magical. If you’re a writer, spice up your stories with it. Make a young girl the object of ridicule and rejection, only to make her all the more deserving of being crowned homecoming queen. Capture the angst of a restaurant owner who can’t seem to drum up any business until a famous celebrity eats there one day and publicizes the homemade apple pie as the best he’s ever tasted. Every story you’ve read, movie you’ve seen, or TV show you’ve watched, if it is any good, has some sort of conflict in it. Even if you don’t notice it at first glance, look again – it is there. Someone may have a problem with someone else. It may be a squabble at the cash register about the price of cereal. A fight may break out as a result. There are so many options. Use them as a guide to crafting your own. Writers seek involvement with the subject matter they are reading. So too should readers. It is important that readers know how to pinpoint what the conflict is, when it started, where it escalated, and how it ended. This will make the reading journey all that much more enjoyable and profound so that when you move on to other works, you can appreciate them all the more for the conflict that interests and fuels your reading desire. 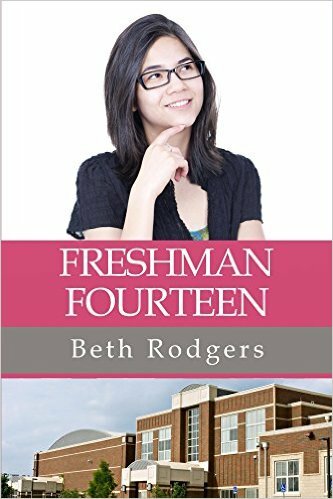 My novel, ‘Freshman Fourteen,’ incorporates a lot of conflict early on especially, as I felt it quite necessary to make main character Margot’s journey through freshman year as difficult as possible at the start. In my mind, that would make her that much more worthy of going through the journey to get past all of the troubles she had. They serve to make her a stronger, more purposeful character. Anything can be construed as conflict. Even writer’s block (or reader’s block, when you don’t know what to pick as your next read) is a conflict. Use the examples above to resolve this and master your own writing and reading techniques. Want more from Beth? You can check out her books on Goodreads HERE. Find Beth on the YA Author Rendezvous site HERE. This was posted by Lauren Mayhew with the express permission of Beth Rodgers.